Home Religion/Ethnicity Christianity Herald permit: Divide-and-rule rears its ugly head? Herald permit: Divide-and-rule rears its ugly head? Four years ago, Christian Malaysians were overjoyed when Prime Minister Abdullah Badawi sent Christmas greetings to their various churches and congregations. It was an astute gesture that touched many Christians, and many of them voted in droves for the BN in the 2004 general election. Now, as we observe Christmas 2007, the mood in many churches is decidedly sombre. 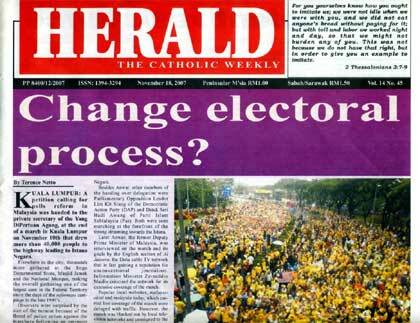 The Catholic Church has not yet received its new publication permit for its weekly Herald newspaper for the coming year, ostensibly because of its use of the term “Allah” to refer to God in its Malay-language section. As a columnist for The Herald, I am deeply disappointed. The Herald’s use of the term “Allah” is nothing new; it has been using the word for years in its Bahasa Malaysia section. See the Aliran statement here. In fact, “Christian Arabs of today have no other word for ‘God’ than ‘Allah'” (Wikipedia). So why has this become an issue now? This is similar to the issue of crucifixes in mission schools. In many mission schools, the crucifixes have long been taken down as local heads replaced the Christian La Salle brothers. So why did BN MPs resurrect this issue in Parliament recently? I suspect it has something to do with playing the old game of divide-and-rule and trying to pit one group against the other to shore up support from their own constituencies. Especially at a time when the BN has to deal with a host of genuine grievances that threatens to erode support for the ruling coalition. If there is one thing the BN fears more than anything else, it is the coming together of all the different ethnic groups in the country to demand justice. In recent weeks, we have seen Malaysians of all ethnic groups demonstrating for justice and accountability. The BN’s PR and attempts at crisis management have been disastrous: it has succeeded in alienating, in turn, workers demanding a minimum wage, the lawyers, civil society groups clamouring for electoral reforms (backed mainly by Malays), Indian Malaysians and now, the Christians. What better time, from the BN’s point view, to try and prevent all these Malaysians from coming together. So the coalition raises divisive issues. And it is so ironic that it is using a widely accepted term for God to divide His people. Malaysians, don’t fall for this! Malays, Chinese, Indians, Kadazans, Ibans and others are our sisters and brothers. Muslims, Buddhists, Christians, Hindus, Sikhs, Taoists and others share noble universal spiritual values such as love, justice, renunciation and compassion for the poor and oppressed. To use the term “Allah” (God) to divide groups takes the cake. Correct me if I am wrong: don’t Muslims believe that Jesus was a prophet of Allah? Now, I ask you, what does Eli (or Eloi) sound like? Anyway, I hear the church has already filed a case in court over the usage of the term “Allah” among other things. So after weeks of preparing the ground and vilifying the Hindraf leaders, the Abdullah administration has used the ISA against them. This is a backward step for democracy. It reveals an administration that has run out of ideas, that is even afraid of its own shadows, afraid of people on the move, unwilling to respect basic rights. In recent weeks, top officials have said they would use the ISA as a “last resort”. That point has been reached. So, now what? The crackdown began ironically on the eve of International Human Rights Day, when a string of lawyers, political activists and other concerned Malaysians were arrested. After them, the Bersih activists were targeted for arrests. And then came the ISA crackdown on the Hindraf leaders. The swoop on the Hindraf leaders does not come as a surprise. For days, the government and its controlled media had been vilifying the movement with one-sided reporting and allegations not supported by evidence. Sycophantic newspaper columnists prepared the ground for the ISA crackdown by conveying the impression that Hindraf leaders were reckless and a threat to national security. Some believe that certain words used or claims made by the Hindraf leaders bordered on exaggeration or were not particularly accurate. But how were they able to mobilise so many Indian Malaysians? Simply because many of the the grievances could not be totally dismissed as without having any basis whatsoever, the Hindraf leaders were able to tap into a reservoir of discontent among the marginalised of the Indian Malaysian community. The government may have presented official statistics that showed a low poverty rate among Indian Malaysians. But what was the monthly household income level used to calculate that poverty rate? The 2.9 per cent poverty rate for Indian Malaysians in 2004 was based on a ridiculously low poverty line level of RM543 monthly household income. And that was before the latest round of petrol and food price hikes. Would RM543 – or even the new Poverty Line Income levels of RM687 and RM698 for urban and rural areas – be enough for families to afford decent housing, health care, a balanced diet and proper education? This column has on many occasions insisted that the official threshold for measuring poverty is too low and unrealistic. Even a senior MIER research official has reportedly admitted that a monthly salary of RM1,200 to RM1,500 is not sufficient for urban dwellers, “given that house rentals alone cost about half of these amounts in the cities”. I challenge our policy makers to raise a family on say, RM800 a month (above the poverty level income) for a year, before they dismiss the problem of poverty in Malaysia so tritely. Samy Vellu was reported as saying that that the average monthly household income of Indian families was RM3,456 compared with the national average of RM3,022. Try telling that to the urban pioneers and the ex-plantation workers about to be evicted from their homes. How much is the price of a low-cost flat these days? And are there enough to go around in the first place? Everyone now knows that the gap between the rich and poor of all ethnic groups is so wide – one of the largest in Asia – that average household income figures (whether by ethnic group or in overall terms) are virtually meaningless. Thus, the figure of RM3,456 probably includes the incomes of the Ananda Krishnans, the Tony Fernandeses, the rich Indian doctors, lawyers and other professionals among the 7 per cent Indian Malaysian population. Similarly for the other ethnic groups. That said, Hindraf should adopt a more inclusive approach to its struggle. When one angry Hindraf supporter phoned me the other day, I reminded him that the struggle for justice should not be viewed from a purely ethnic perspective – for the issues of marginalisation, exploitation and oppression cut across all ethnic groups. I reminded him of the Penan displaced from their native customary land, the poor indigenous communities living in the interior areas of Sabah and Sarawak, and the struggling Malays on the east coast of the peninsula – who ironically remain poor despite the considerable offshore oil reserves in these regions. The wages of workers – especially the Malay and Indian Malaysian blue-collar workers – have been depressed by a policy of importing cheap migrant labour to increase the profits of the corporate class (comprising all ethnic groups). I believe it is also the top-down approach to economic policy making – which favours the large connected corporations – that is responsible for so much of the marginalisation we see today. The Hindraf leaders, like many others before them, do not deserve the unjust ISA. Nobody does – for nobody should be detained without trial. Detaining the Hindraf leaders and other critics under this harsh law will not resolve the underlying causes of the disenchantment among the public. It will not solve the grievances expressed. Many will view the crackdown as aimed at suppressing legitimate dissent ahead of the coming general election. On the day the crackdown began (9 Dec), the readings from the Sunday Mass spoke of a God deeply concerned that his people, especially the poor and the oppressed, shall be ruled with Justice. … he shall judge the poor with justice, and decide aright for the land’s afflicted. He shall strike the ruthless with the rod of his mouth, and with the breath of his lips he shall slay the wicked. The government’s control of the word “Allah” proves that religious freedom in Malaysia is threatened. It’s a mockery of Article 11 of the Federal Constiturion which guarantees freedom of religion. well as a regular contributor to herald, i’m disappointed too. i had blog extensively on this issue and received many comments, most of them don’t see any wrong in herald using ‘allah’. some of them even gave proof of how ‘allah’ is not exclusively belongs to the muslim.